Italian club Inter Milan have finally announced the signing of Manchester United captain Nemanja Vidic on a free transfer after months of speculation. The Serbian international had previously announced his intention to leave the Red Devils this summer as his contract winds down, and the Italians have moved quickly to confirm that the defender has put pen to paper. 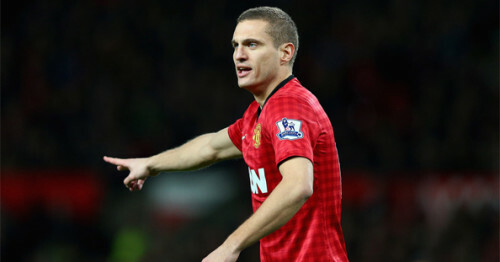 Vidic has seen limited playing time alongside long-time partner Rio Ferdinand this season, with both of the aging stars suffering a string of injury problems. The Serbian remains a key figure for new manager David Moyes, however, as the Scot has opted to keep Vidic as club captain until the end of the season. Vidic will arrive at the San Siro in June, as unveiled by the club’s official Twitter account, which means he won’t have any time to waste in Norwegian online casinos before meeting up with his new teammates in the midst of this summer’s hectic World Cup schedule. Vidic’s Serbia did not qualify for the tournament, meaning he will likely be joining his new teammates on their preseason tour of the United States.